Hemicatenane is a structure that forms when two DNA duplexes are physically linked through a single-stranded crossover. It is proposed to be an intermediate resulting from double Holliday junction (dHJ) dissolution, repair of replication stalled forks and late stage replication. 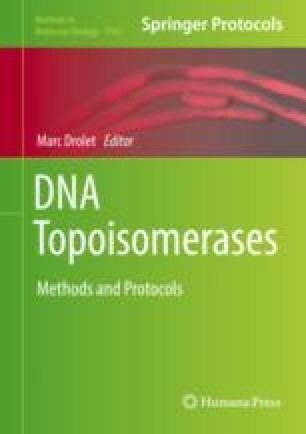 Our previous study has shown that hemicatenane can be synthesized and dissolved in vitro by hyperthermophilic type IA topoisomerases. Here we present the protocol of hemicatenane synthesis and its structure detection by 2D agarose gel electrophoresis. The generated product can be used as a substrate to study the biochemical mechanism of hemicatenane processing reactions. This work is dedicated to our late mentor, Dr. Tao-shih Hsieh, who passed away during the preparation of this chapter. We would like to thank Dr. Christian Biertümpfel for critical reading of the manuscript. This work was supported by National Institutes of Health Grant GM29006 and Academia Sinica intramural funding (to Tao-shih Hsieh).